The Hutterite Diaries by Linda Maendel is a 150 page memoir about the Hutterite people. It is published by MennoMedia and was released on May 18, 2015. To purchase your own copy, click here. 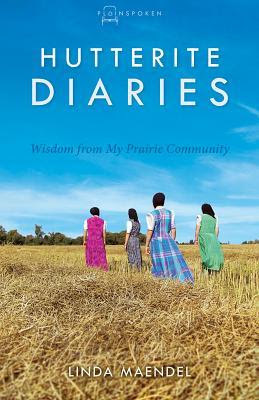 The Hutterite Diaries is a delightful and interesting read. The book is written like you are sitting and talking to your friend over a cup of coffee. Hutterite Diaries flowed easily and it only took a couple of hours to read. What was different about this memoir compared to others I have read is that it is divided into sections. Each chapter has an applicable quote at the beginning which gives the reader a preview of what is to come. Linda shares a lot of her culture and herself. Her love of her people shines deeply though her words. She is honest and caring. The humor and stories she adds to the book make the book fun and joyful. The way Linda uses description makes you draw mental pictures in your mind; it is as if you are right there with her in her community. Linda includes some of the history of the Hutterite people. This really gives the reader a bird’s eye view of what their people have gone through, yet survived. Linda also discusses some threats to her culture. Her honesty is refreshing. Thank you to the Litfuse Chicks for a free copy of this book in exchange for my honest review. No monetary compensation has been received and all views expressed are my own. This giveaway ends on June 4, 2015 at 11:59 PDT. 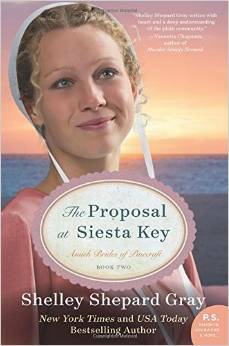 The Proposal at Siesta Key by Shelley Shepard Grey is a 288 page novel in the Amish fiction genre. It is the second book in The Pinecraft Brides series but can be read as a stand alone. The Proposal at Siesta Key is published by Avon Inspire and was released on May 15, 2015. To purchase your copy, click here. The Proposal at Siesta Key is a sweet, easy story that I could read over and over again. Shelley drew me in right from the start and I wanted to keep flipping page after page to see how the story unfolds. I can not wait for the next installment of the series. The relationships built throughout this book really draw you in. As a parent, I can relate to Penny Troyer’s parents who want to keep her safe and close. Yet, you can understand Penny’s desire to be free and make relationships of her own. I can also relate to Michael and his disability. He struggles with the desire to please his family, who have been through so much, and his desire to be free. Michael wants to please God as well and it is sometimes difficult to know what plan God has for you. Shelley does a wonderful job creating depth in these characters and the tension she adds makes you want to keep reading. The Proposal at Siesta Key is very encouraging and full of wisdom. Shelley has a phenomenal way of interweaving the truth of “life is not easy” while also reminding us to cherish each moment we have because we can never get that moment back. I give this book a 5 out of 5 stars. Grab your coffee and banana nut muffin and join me in Florida at the Orange Blossom Inn! This is one book you will want to read again! Thank you to Litfuse Chicks for a free copy of this book in exchange for my honest review. This giveaway ends on June 3, 2015 at 11:59 PDT. Small print: This giveaway is sponsored by Simple Harvest Reads. The winner will be contacted via e-mail and will have 30 days to claim their prize. Simple Harvest Reads is not responsible for prizes lost or damaged by the post office. As Love Blooms by Lorna Seilstad is a 320 page novel in the Christian historical romance genre. It is the third installment in The Gregory Sisters series but can be read as a stand alone. 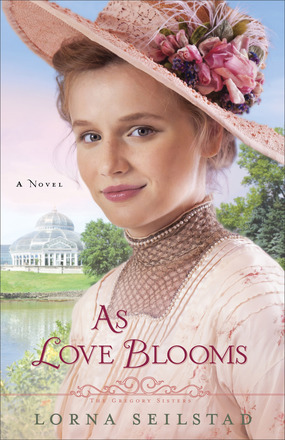 As Love Blooms is published by Revell Publishers and was released on May 19. To purchase your copy from Amazon, click here or from Barnes & Noble, click here. Tessa Gregory is nothing if not tenacious. Denied a position as a horticulturalist at prestigious Como Park in Saint Paul, she is not above a little benevolent deception in order to get the park superintendent to change his mind and hire her. She plans to infiltrate the world of wealthy and influential people in hopes of drumming up financial support for a world-class conservatory. But before she can put those plans into action, she meets Reese King, a handsome gardener at Como Park–and a major distraction. Still, Reese might be the key to achieving her dream. But is his goal to help her . . . or to capture her heart? Against a lush backdrop of early twentieth century Saint Paul, Minnesota, Lorna Seilstad weaves a sweet and sassy story that is sure to please. Tessa’s young romance opens like a rose, stealing readers’ hearts and filling their senses with the intoxicating fragrance of dreams come true. As Love Blooms is a sweet story about a girl who finds love while struggling to fulfill her dreams and struggling to find who she is during a time in history that was redefining women. The relationship between the sisters is wonderfully constructed and the reader can see their strengths, weaknesses, struggles and support of each other throughout the story. The girls relationship with their Aunt Sam is different than most relationships but you can see how much love they have for each other. The book also focuses on Reece and his struggle to step out of his father’s spotlight. I enjoyed his relationship with is friend, Erik and his wife as well as his landlady. This relationship gave insight into his character making it a pleasure to read a book that toggles between two main characters. In the background of As Love Blooms is the focus on horticulture. The story reflects the knowledge and research completed by the author regarding this subject. There was a lot of interesting information given and the nuances about what was popular at the time or going on in horticulture during that time in history added to the story. Added to this is the question of women being involved professionally in the horticulture industry or just in private homes makes the story line interesting. Thank you to Revell Publishers for a free copy of As Love Blooms in exchange for my honest review. No monetary compensation has be received and all opinions expressed are my own. A history buff, antique collector, and former high school English teacher, fan favorite Lorna Seilstad is the author of When Love Calls, While Love Stirs, and the Lake Manawa Summers series. A member of American Christian Fiction Writers, Lorna lives in Iowa with her husband. Learn more at www.lornaseilstad.com. This giveaway ends on Tuesday, May 26 at 11:59pm PDT. 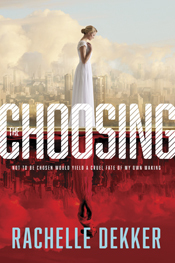 The Choosing by Rachelle Dekker is a 448 page dystopian novel. It is published by Tyndale and released on May 19, 2015. To purchase your copy from Amazon, click here or from Barnes & Noble, click here. I have to admit when I received this book I was a little nervous about reading it. Ted Dekker’s books are great and I was concerned I would be disappointed. I wasn’t! Rachelle drew me in from the beginning and I was hooked until the last page. The Choosing leaves a good impression on the reader and makes you want more. She has stepped out of her father’s shadow and is creating an amazing one of her own. The writing in The Choosing is excellent. Rachelle uses such detailed descriptions you feel as if you are right there with the characters. Where some dystopian novels feel disjointed and are hard to follow, The Choosing flowed well and was easy to understand. I loved how Rachelle addresses the issue of worthlessness in her novel. Most everyone has dealt with this issue at some point in their life and she does a marvelous job of pointing to who we should be getting our self-worth from: God. Where most dystopian novels leave you feeling bleak, The Choosing leaves you feeling hope. I give this book 5 out of 5 stars. After reading many dystopian novels, this one was new and had a refreshing take. Thank you to Tyndale Publishers for a free copy of The Choosing in exchange for my honest review. No monetary compensation was received and all opinions expressed are my own. 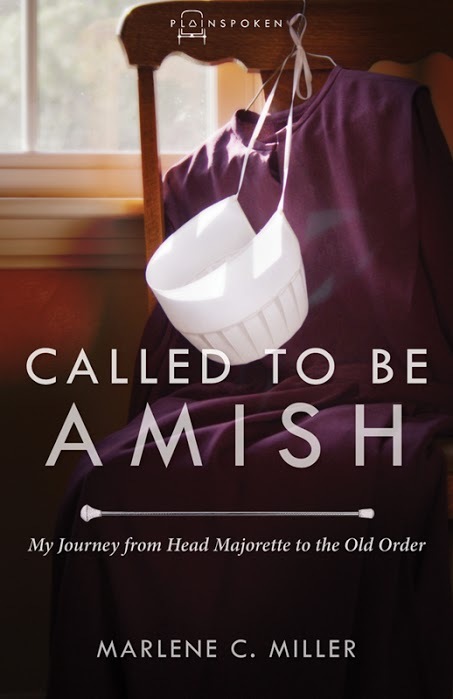 Called to Be Amish by Marlene Miller is a 256 page novel Amish Memoir. It was published by MennoMedia and released on February 9, 2015. To purchase your own copy from Amazon, click here or from Barnes & Noble, click here. Fewer than one hundred outsiders have joined the Old-Order Amish—and stayed—since 1950. Marlene C. Miller is one of them. Called to Be Amish gives a rare glimpse into the life of the Old-Order Amish. Reading this memoir was like sitting down with a cup of coffee and talking to an old friend who you are eager to catch up with. Marlene opens up and deeply shares about her life: The good, the bad, and sometimes the ugly. The questions to the author at the end are a must read – very interesting and informative. There are yummy, must try recipes included as well. Marlene shares and explains many of the Amish traditions in Called to Be Amish. Her writing is not polished like other authors, however, this gives the memoir authenticity. The reader feels as if they are right in the midst of Marlene’s life watching the events as the unfold. She shares her beliefs as if she was having a conversation with you; she is not preachy or trying to convert you to her way of thinking. Marlene is just sharing her story with you. It felt like a privilege to get to read her story. What shines through in Called to Be Amish is the love of Christ shown by Marlene, her husband, and most of her husband’s family. The sacrifices Marlene made to show her love for Christ and how her life changed after her conversion really makes is inspiring and very encouraging. This book inspired me to take a hard look at my life; at what is important and what I am willing to sacrifice for Christ. I give Called to Be Amish 5 out of 5 stars. With so many television shows and authors who are neither true to the Amish nor their culture, it was refreshing to read a book that accomplished both. You will walk away from this book knowing your life has been enriched by reading it. Thank you to the Litfuse Chicks for a free copy of Called to Be Amish in return for my honest review. No monetary compensation was received and all opinions stated are my own. This contest ends Sunday, May 24, 11:59 PST. 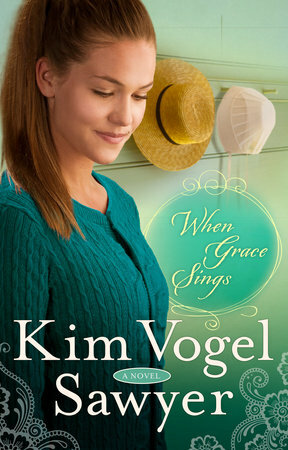 When Grace Sings is a 352 page novel in the Amish/Mennonite fiction genre. It is published by WaterBrook Press and released on March 17, 2015. To purchase your copy through Amazon, click here or through Barnes & Noble, click here. When Grace Sings is a fast paced novel that gives interesting insight into the lives of the Mennonite peoples. It is the second book in The Zimmerman Restoration Trilogy, but can be read as a stand alone. While I did not read the first book, I was able to easily follow the storyline of this book. This story drew me in right from the beginning. There was romance; there were secrets; there were surprises! It is amazing when an author writes a great story, but to do so with two story lines running simultaneously is phenomenal. I was not able to put it down and read it in one sitting. I give this book 5 out of 5 stars. My only complaint is the cliffhanger! I want to know what happens and can’t wait for the next book. Thank you to Litfuse Publicity and Blogging for Books for a free copy of When Grace Sings in exchange for my honest review. No monetary compensation has been received for this review and all opinions expressed are my own. In 1966, Kim Vogel Sawyer told her kindergarten teacher that someday people would check out her book in libraries. That little-girl dream came true in 2006 with the release of Waiting for Summer’s Return. Since then, Kim has watched God expand her dream beyond her childhood imaginings. With over 30 titles on library shelves and more than a 1.5 copies of her books in print, she enjoys a full-time writing and speaking ministry. Empty-nesters, Kim and her retired military husband, Don, enjoy a quiet existence in small-town Kansas, the setting for many of her novels. When she isn’t writing, Kim stays active serving in her church’s women’s and music ministries, traveling with “The Hubs,” and spoiling her quiver full of grand-darlings. This giveaway ends May 21st at 11:59 EST. 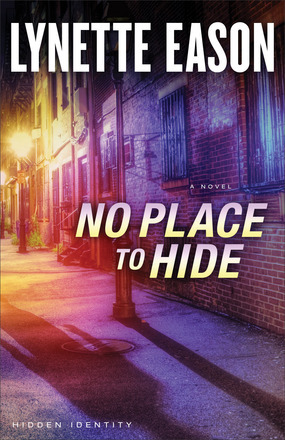 No Place to Hide by Lynette Eason is a 336 page novel in the Christian romantic suspense genre. It is published by Revell and released on May 5, 2015. To purchase your copy from Amazon, click here or from Barnes & Noble, click here. It’s not every day you see your childhood friend and one-time crush on national news. Jackie Sellers just wishes it were under different circumstances. She can’t believe that Ian Lockwood is wanted in connection with a terrorist plot, and she’s determined to find him and help him clear his name. But she’s not the only one looking. The FBI wants him captured. The bad guys want him dead. Ian just wants to stay alive long enough to save thousands of innocent lives. From the first page of No Place to Hide, I was hooked! Although slow in certain places, there were many surprises and the suspense made you want to keep reading. It is obvious that Eason has done her research and the storyline was very believable. Friendship is an overall theme in this novel and it inspires the reader to contemplate the friendships in their lives as well as how much you would sacrifice for them. The characters in No Place to Hide were interesting and well developed. I really enjoyed how Eason weaved in Jack Sellers faith into the storyline. The interactions between all the characters helps to draw the reader into the story and although there is romance, it takes a backseat to the suspense which made the book even more enjoyable. This is my first experience with Eason’s books however, I was able to follow the story like a stand alone. I am looking forward to reading more of her books. I give No Place to Hide 4 out of 5 stars. Christian suspense readers will really enjoy this book! Thank you to Revell Publishers for a free copy of No Place to Hide in exchange for my honest review. No monetary compensation was received and all opinions expressed are my own. Lynette Eason is the bestselling author of the Women of Justice series and the Deadly Reunions series, as well as No One to Trust and Nowhere to Turn. She is a member of American Christian Fiction Writers and Romance Writers of America. She has a master’s degree in education from Converse College, and she lives in South Carolina. Learn more at www.lynetteeason.com. To enter to win a copy of Lynette Eason’s No Place to Hide, click on the words “Entry-form” and fill out the information. This giveaway ends on Monday, May 18 at 11:59am. 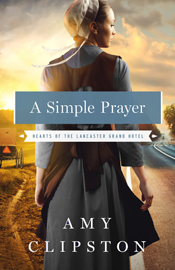 A Simple Prayer, written by Amy Clipston and publish by Zondervan, is a 320 page Amish novel in the Christian romance genre. To pre-order your copy now through Amazon click here or through Barnes and Noble, click here. The release date is May 5, 2015. Aaron Ebersol left the Amish community seventeen years ago when he could no longer bear the restrictions or the constant tension with his father. Despite years of unanswered letters to his parents, and the roots he’s put down in Missouri, Aaron rushes back to the Amish community of Paradise, Pennsylvania, after receiving word of his mother’s stroke. Hesitant to get too close to the family he was once a part of, he decides to stay at the Heart of Paradise Bed & Breakfast. Talking with Linda allows him to explore his feelings about his family and his position in the Amish community. Amy creates a heart-warming story in her fourth and last installment of her Hearts of the Lancaster Grand Hotel series. Her storyline is wonderful. It draws you in from the beginning and you want to see what happens to each of these characters. A Simple Prayer can be read in order of the series but can also be read as a stand alone. Amy’s A Simple Prayer cuts to the heart of what many of us struggle with: acceptance. All of us want to be accepted by our family or find forgiveness when we have done wrong. It is also a story of differing family dynamics; how our choices, both good and bad, affect those we love. There is a character that every reader can relate too in this story. In a genre with many authors and many books being released each month, A Simple Prayer is a book that is memorable. It has characters that make you want to yell, ones that make you want to cry, ones that make you want to cheer. Amy captivates your heart with her character’s realism and strength you can draw from. A special thank you to netgalley for a copy of the book in exchange for my honest review. All opinions expressed are my own, and no monetary compensation was received for this review. In honor of Amy’s new release and Mother’s Day, I am giving away one copy of An Amish Cradle. Click on “Entry-Form” below to enter. The giveaway ends on Sunday, May 10 at 11:59 PST. 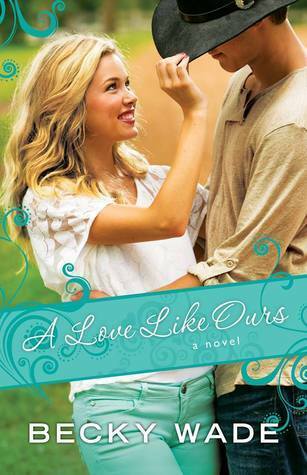 A Love Like Ours by Becky Wade is a 368 page novel in the Christian Contemporary Romance genre. Although it is the third book in the series, it can be read as a stand-alone. It is published by Bethany House Publishers and released on May 5, 2015. To purchase your copy from Amazon, click here or from Barnes and Noble, click here. A Love Like Ours is a sweet romantic novel full of wonderful characters and imagery. Where most romances focus on two main characters, A Love Like Ours includes many characters which adds richness and balance to the story. The inspiration and hope portrayed throughout this novel is an encouragement to anyone but especially those trying to overcome the struggles in their life. I love the relationships that are revealed and created throughout A Love Like Ours. Lyndie, one of the main protagonists, has a sister who is disabled. Wade weaves both the difficulty of having a disabled family member and the joy a disabled family member can bring into the story beautifully. She also gives an eye opening account of what servicemen suffer when coming home and trying to adapt to everyday life. The plotline of A Love Like Ours centers around horse racing, something I have never had much exposure too. Wade does a magnificent job of making it easy for the reader to follow this plotline by including pertinent information regarding horse racing in an interesting way. The storyline does drag a little in the middle, however, the horse racing plotline helps to move the story along. I give this book 4 out of 5 stars. It is an encouraging read. Thank you to the Litfuse Chicks and Bethany House Publishers for a free copy of A Love Like Ours in exchange for my honest review. No monetary compensation was received and all opinions expressed are my own. To enter to win a copy of Becky Wade’s new book A Love Like Ours, click “Entry-Form” below. This giveaway ends on May 8 at 11:59 PST. Enter today by clicking the icon below. But hurry, the giveaway ends on May 26th. Winner will be announced May 27th on Becky’s site. Congratulations to Kathryn, the winner of a copy of Side by Side. Enjoy! Side by Side by Jana Kelley is a 221 page novel in the Contemporary Missionary Fiction genre. It is published by New Hope Publishers and was released on November 17, 2014. To purchase your copy through Amazon, please click here or through Barnes and Noble, click here. Side by Side is a powerful and life-changing novel. Jana draws from her experiences as a missionary to weave real-life events to cast a story that will leave the reader changed forever. Each day we go about our lives without a second thought to the blessings we have: food, housing, opportunities, choices, and most of all freedoms. Freedom to speak our minds, have choices over our bodies, and to share our love of Christ. Side by Side pulls us into a different world where Christians risk their lives everyday to stand up for Jesus. It also conveys the sacrifices missionaries and their families make on a daily basis to share the Gospel and minister to others. Side by Side gives the reader an appreciation for the blessings they have and will compel the reader to evaluate what they are willing to sacrifice for Christ. Jana’s characters are open and honest in her novel. The reader can see the struggles of selfishness, pride, and frustration. I liked that those feelings are included and not glossed over. This makes her characters real and believable; it also encourages us to empathize with the characters. Jana additionally shows the plight of women in Muslim countries by including difficult topics such as female circumcision with tact. Her knowledge of the culture and her love of the Muslim people shine through in her characters. I give this book 5 out of 5 stars. This book will change your worldview, give you first hand knowledge of the dangers of missionary work and give you information on how to pray for missionaries. Side by Side is a must read for all Christians who would like to know how better to minister to Muslims. 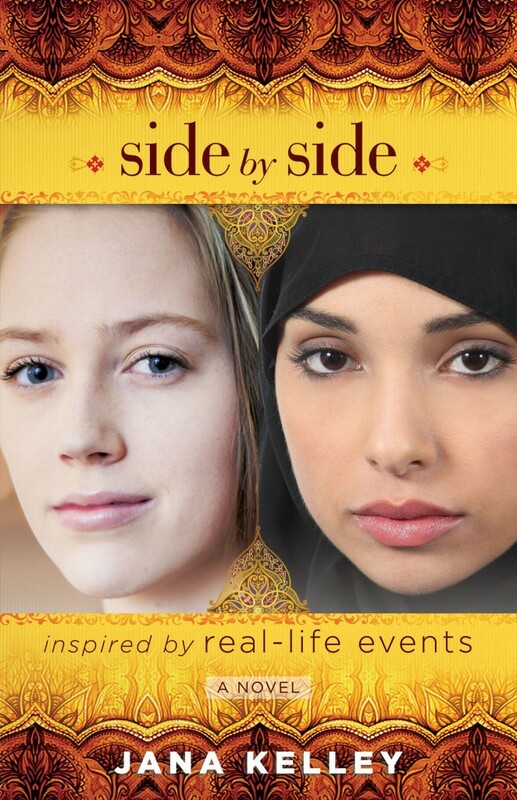 Thank you to the Litfuse Chicks and New Hope Publishers for a free copy of Side by Side in exchange for my honest review. No monetary compensation was received and all opinions expressed are my own. Enter to win a copy of Jana Kelley’s Side by Side by clicking “Entry-Form” below.